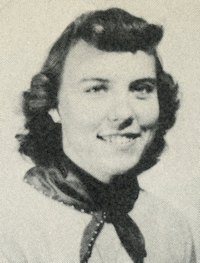 Obituary – Webb, Elizabeth Virginia (Henderson) « Perry High School Alumni Association, Inc.
﻿Freshman Assembly 49-50, Sophomore Assembly 50-51, Student Council 50-51, Library 51-52, Band Twirler 49-53, Junior Play 51-52, Glee Club 50-53, Glee Club Sextet 50-51, F.T.A. 52-53. Elizabeth Virginia (Jigger) Webb, 73, died Saturday, Dec. 30, 2006. Services will be at 2 p.m. Friday in the First United Methodist Church in Perry. Pastor Craig Gibson will officiate, assisted by the Rev. Ed Cook. Interment will be in Morrison Cemetery. A family visitation will be from 6 to 8 p.m. Thursday in Brown-Dugger Funeral Home. Memorials may be made to the Company I Foundation, Scholarship Fund or the Perry Alumni Association for Scholarships in care of Brown-Dugger Funeral Home, 1010 N. 7th Street, Perry, Okla. 73077. She was born in Raymondville, Texas, Dec. 9, 1933, to Wade and Lena (Ottinger) Henderson. At the age of seven, she moved to Colorado. In 1944, the family moved to Perry, where she grew up. During high school, she became a featured twirler in the Perry Maroon Marching Band and was the first to throw double fire batons. During her senior year in high school, she met her future husband, Carl R. Webb, who was a friend of her two brothers, Morris and Sam. They were married in 1953 and established a home in Tulsa, where they resided for most of their marriage. She had many talents and friends and will be truly missed. During her life, she assisted her husband in running his CPA firm. A homemaker in every sense of the word, she was a wonderful cook and accomplished seamstress. An avid reader, she was a Martha Stewart before her time. When her kids were young, she provided a welcome home, not just for her family but also for their friends. Her house was known as the “house to play at.” She raised her children to be independent, educated and to think for themselves. She was a wife, mother, grandmother, great grandmother to her family and a confidante to her many friends. If she was known for one thing, it was that she always had a smile on her face and a welcome in her heart. 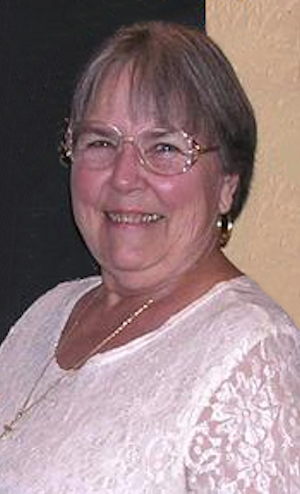 She leaves behind her husband of 53 years; five children, Terri and her husband, Chris Diamond, Susi Laird, Phillip and his wife, Kristy, Judi and her husband, Bruce Spence and Patti and her husband, Kevin Doherty; 11 grandchildren and eight great-grandchildren.